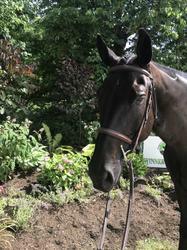 Brookfield Farms of Clarence, NY proudly offers Cornerstone for sale.This striking black gelding will catch any judge’s eye. In the barn he is an absolute pleasure to work with and a true gentleman. Cornerstone is an extremely simple, straightforward, and safe ride. “Stone”is the ultimate teacher and an extremely useful horse to have around the barn. 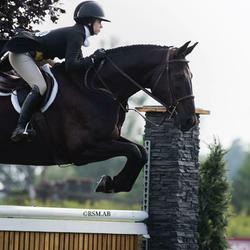 He will gladly teach someone to navigate a 2’6” Hunter course, step into the derbies, or even march around in the Equitation ring. 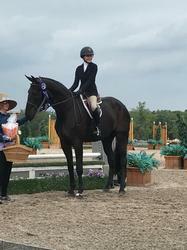 He jumps Liverpools with ease, has clean changes, and is schooled up to third level dressage. “Stone” has plenty of step and scope to do whatever job possibly needed. He has recently competed in multiple medal classes and Hunter Derbies including the International Derby at the Chagrin Valley Classic! Bigeq.com is an awesome site. I received lots of calls.